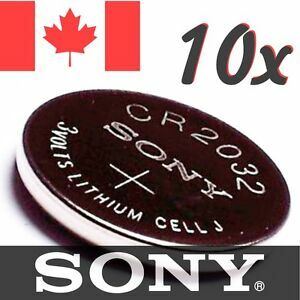 Détails : 10 Pcs CR2032 Lithium Battery DL 2032 Sony 3V coin cell button bouton pile. 10 Pcs CR2032 Lithium Battery DL 2032 Sony 3V coin cell button bouton pile. Il reste 138 objets. Veuillez saisir un nombre inférieur ou égal à 138. Un paiement immédiat de 11,99 $C est requis. good batteries, quick shipping, can't beat their prices, will be repeat customer!!!! I bought these to replace the battery on the computer motherboard. After installation (removal of the old dead battery and replacement with this "new" battery), the computer immediately reported that the battery had low voltage. The date on the battery packaging states use by 2026 so I do not know what is up. Bottom line, I am disappointed in this purchase. I was expecting batteries with a full charge. Back to buying more batteries - but this time I will just buy at a store - pay more but have a recourse if I run into the same problem. Quick shipping though on these batteries. Batteries are new, at the price very good value for money.